Mylece Burling received her BA degree from UO with a major in Romance languages in Portuguese and Spanish. She joined LTS in 2012 and graduated in 2013. Her MA project was titled, “A Teaching Portfolio of Workshop Tasks for Brazilian English Teachers Applying for the HE/Capes Scholarship”. 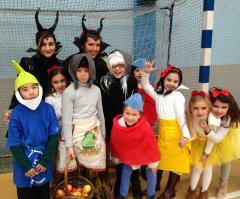 She is shown here (on right, as Malificent, the evil stepmother of Snow White) with another teacher and some of her students at Halloween. What was your MA project about? My MA project was a teaching portfolio of English language tasks for English teachers in Brazil. The objective was to help non-native English teachers to navigate the pragmatic and linguistic language barriers of the scholarship application, in order to enable them to continue their professional development as English teachers. What did you learn in LTS that are you using as a teacher now? LTS has helped me to begin to develop the ability to effectively select activities and plan lessons that are relevant and useful for my students. It provided a framework that I have been using as a way to structure my lessons. It has helped me to organize and analyze my teaching in a way that I can view my lessons objectively, evaluate and try to change and improve. What did you find most challenging as a new teacher? Student motivation. Of course as a new teacher my lessons could be more effective; however, if students are not also somewhat self-motivated they will not learn. The importance of student motivation was something I could not understand without real life teaching experience and it is something I wish I would have spent more time on during LTS. Inspiring one’s students to teach themselves is the ultimate goal of any teacher. You are now teaching English in Spain, but also pursuing other interests dear to your heart. Can you describe what you are doing, and why you chose Spain? I first came to Spain through the “Auxiliares de Conversación” program and taught English to all levels in a public elementary school for one year in the city of La Coruña, in the Northwest of Spain. Currently I am teaching English part time at a private academy in Madrid. I teach all levels and all ages from primary to retired adults, absolute beginners to nearly bilingual. Due to the economic situation in Spain many citizens are searching for work outside the country. As English is the language used for communication among citizens of different countries for matters of business and tourism, there is a high demand for English education in Spain. My LTS degree has been indispensable in finding work here as it provides access to better positions in better schools. In addition to my work I am also studying sculpture at one of the official state-sponsored art schools, for which I moved to the capital, Madrid. After this first year I intend to specialize in wood or stone. Europe is the basis of the history of Western civilization and art. Being in this environment has contributed to my continuing education of art history, providing inspiration and a solid background for my artwork. I intend to stay in school as long as possible, though it has proved considerably more challenging to study art on a professional level than I originally thought. I also enjoy rock climbing which has been popular in Spain since the birth of the sport in France and is world famous for its limestone cliffs in the northeastern mountain ranges. Last year I was able to find more time to travel and climb, while this year it has been hard to find time for everything. What advice to you have for current or prospective LTS students? My advice to current and prospective LTS students is not to forget the importance of your peers as a resource. While you are together try to learn as much as possible from one another.